A huge fireball hurled across the night sky in Spain at an approximate speed of 72,000 kilometers per hour. It was visible in all parts of the country and is believed to be a piece of an asteroid. 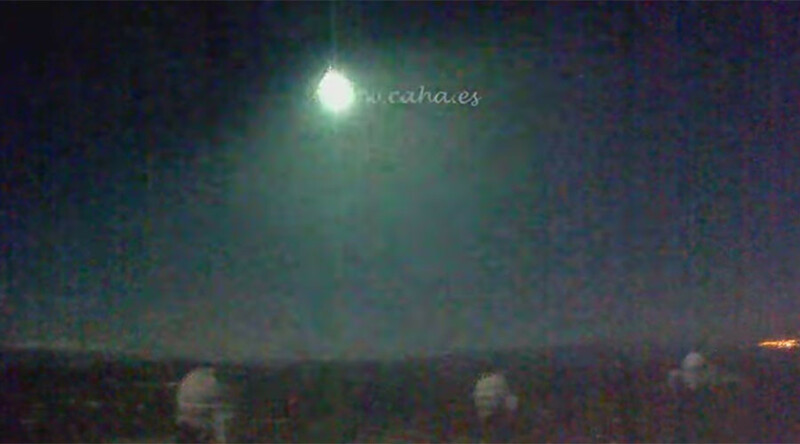 The fireball was first spotted by Spanish scientists at 22:25 local time on Sunday as it passed over the southern regions of Andalucia, Granada and Jaen. The object was described as a part of an asteroid to El Pais by Jose Maria Madiedo, an astrophysicist of the University of Huelva. It was “considerable in size” so that "it could survive its passage through the Earth's atmosphere," Madiedo told Europa Press. — CanalSurNoticias (@CSurNoticias) 12 декабря 2016 г.
Eyewitness accounts and preliminary analysis of the phenomenon led scientists to believe that the “fireball” could have fallen to the ground in the form of a meteorite, Spanish media reported. — RTn #Andalucía (@RTn_Andalucia) 12 декабря 2016 г. — RT (@RT_com) 6 декабря 2016 г.